Thank you for purchasing an Adkins Yearbook Shout Out! Please follow these instructions only if you purchased your shout out from the Adkins PTA website. The Yearbook committee is in the process of organizing the ShoutOuts and needs some information from you to complete the pages. Below are the templates that will be used to create each ShoutOut. Please respond to this email with the information needed as soon as you can before the deadline of February 15th. 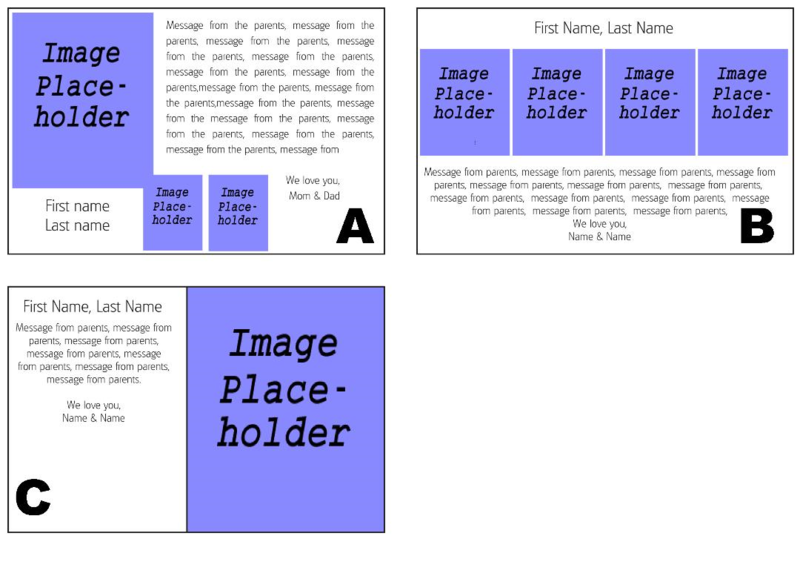 Review the template examples below and tell us which template you would like to use. A, B or C? Provide the photos to place in the template. Note: The photos must be a JPG or PNG file in the original file size. Please do not send photos that have been downloaded from Social Media. They tend to be very small in size and do not print well. Provide the message you would like printed in the ShoutOut (250 words or less). Directory School Supplies on Sale!